HEARING PROBLEMS AND OTHER DISORDERS of the ear affect millions of children and adults each year, making it difficult for them to participate fully in the world around them. Advances in the treatment have brought improved hearing to many patients who were previously thought to be untreatable. 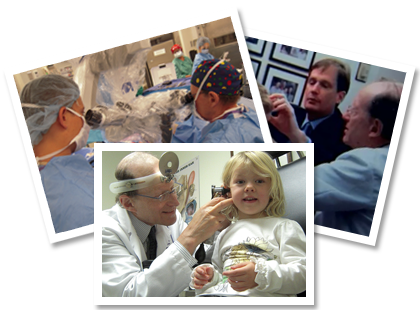 Dr. Paul Eric Hammerschlag has accumulated a broad educational and clinical background in otology, the treatment of ear disease, and utilizes established techniques and therapeutic innovations to afford his patients new opportunities for a higher quality of life. At the heart of his services is an understanding and empathy for patients through innovation, patient education and commitment. Welcome to the Offices of Paul E. Hammerschlag, MD, FACS offering a comprehensive approach to adult and pediatric ear disease. Visit our library of Internet resources related to otolaryngology. At New York Ear we diagnose and treat ear, hearing, facial nerve, skull base and migraine-induced balance or vertigo problems. Our expertise, experience and commitment to comprehensive care of our patients helps them to live healthy, productive lives. Contact Dr. Hammerschlag’s office for your complete and personal evaluation for hearing loss, facial nerve, BAHA device, migraine-induced vertigo or dizziness problems, or any related issue you face. Dr. Hammerschlag is principal investigator in multicenter clinical trial study for a new medical treatment of Meniere’s Disease at New York University Langone Medical Center. If you are interested in finding more about this study and to determine if you qualify to participate in this FDA approved study, please contact Mr. Jose Martinez, Senior Clinical Research Coordinator at 201 478 2145. Please read our most recent reviews received from patients in office and from around the web. To see a complete listing of reviews and filter through them by procedure or site please go to our patient review page.